One of the ways we differentiated ourselves from regular wholesalers was showcasing how our flowers are harvested and delivered in buckets of water, so they never undergo the stress of laying flat and dry in boxes and don’t need to be re-hydrated or conditioned when they arrive at the florist shop. We quickly learned, however, that securing buckets in the back of a vehicle without having them tip over or wobble around posed something of a challenge. During our first few weeks of deliveries, we did experience some buckets tipping over, spilling water in the van, and damaging the flowers—and we wanted to make sure that never happened again! Since we were growing a lot of longer-stemmed flowers such as delphinium, larkspur, lilies, sunflowers, and French tulips, we found that transporting them in tall, narrow buckets was the best way to keep them supported and upright and to prevent them from flopping outward, breaking, or tangling. These buckets can also be very top heavy and tend to fall over if you don’t secure them properly. We solved this problem by creating a grouping of simple wooden racks, each one specifically measured and sized to fit a certain kind of bucket very tightly. These racks are long, narrow, lightweight, and can be quickly and easily changed out depending on what we are delivering that day. We also have a grid-shaped, slightly taller rack that can fit a variety of odd sized, wider and tapered buckets. The rack shape also allows us to take out one or two of them and use that space to place larger items such as rectangular Procona buckets, large Tupperware containers, or boxes of foliage with the remaining racks securing them in place. When I am only packing a few buckets in a personal vehicle instead of the delivery van, I use empty buckets in between flower buckets to keep them from tipping over or sliding around. I recommend this method to our DIY brides as well. Every bit of real estate in your vehicle should be covered with full or empty buckets, so there is no room for anything to tip over or slide around. Harvest flowers such as lilies and tulips at a very tight stage. 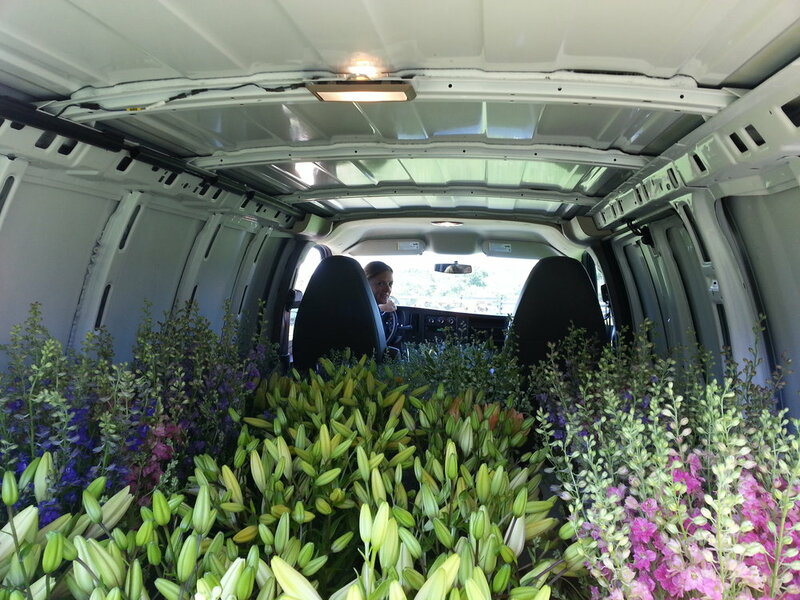 You will be surprised how much they color up and want to open during a trip in the delivery van, even with the air conditioning blasting. You don’t want to show up at the florist shop with blown out flowers. Designers appreciate receiving blooms in a tight bud stage unless they specifically request otherwise. If they order several bunches for daily use in the shop, it is nice to give them a variety: mostly tight, some medium, a few opening and ready to use. Each bucket should be so secure that it cannot wobble, shake, slide, or move around in any way. If you leave any room for a bucket to tip over, it will. Use the tallest, narrowest bucket that is of appropriate size for each variety, and make sure the bucket is full but not so crowded that the petals are squished. Keeping the stems as upright as possible—and not leaving any room for them to flop around or sink within the bucket—prevents them from banging together and bruising when you inevitably drive over potholes or other bumps in the road. It is also a more efficient use of space and makes it possible to fit more buckets in the vehicle. Plan to bunch your flowers with rubber bands at the bottom of the stems rather than keeping them loose in the buckets for delivery. This will help prevent the stems from sagging down in the water and bending—this is especially true for French tulips. Metal spring clamps are also handy for keeping boxes from sliding around. Place the box in between two racks and put a clamp down over the rack's edge both at the front and the back. The V-shaped handle will stick out just enough to keep the box from sliding. After a few years of delivering wholesale flowers, we began doing more weddings and found that our needs had changed a bit, but the principles were the same. Dean designed smaller wooden boxes with dividers suitable for transporting filled mason jars and vases. When transporting groups of jars or vases, such as your bouquets or centerpieces, use waterproof materials such as wood, plastic, or metal for your containers. Cardboard inevitably becomes wet and loses its structural integrity, which looks messy and unprofessional. Some designers travel without the water and add it upon arrival at the venue, but we are sticklers for having a water source for the flowers at all times. A little splashing onto our wooden racks is not a problem, but on cardboard, it is a disaster. It’s handy to use containers with built-in dividers. You can build your own as we did, or find old-fashioned toolboxes and mason jar carriers at antique stores. Sometimes you still have to stuff material between the jar and the wall of the container to eliminate any wobbling. Beware of cheap knock-offs of antique carriers at modern home stores, often the bottoms are only glued on and aren't strong enough to handle the weight of bouquets in vases. These racks are also useful for presenting bouquets to partial-service pick-up customers and provide a convenient way for them to transport their bouquets to the venue. Make sure you include a deposit for these items in your quote, so you are covered if they fail to return them. You can also charge for them outright or incorporate the cost into the designed elements. Winter is a great time on the farm to do some thinking and planning about your delivery system and to build some new racks for your vehicle. I would love to hear about any tips you may have as well in the comments below! Nancy and Dean are a husband and wife team who have been growing cut flowers for 10 years on their farm in Charlestown, RI. Now South County Flowers is also a wedding venue, where Nancy provides brides with floral design services using local, seasonal flowers grown on their farm. Team Flower member since May 2018.